Hadrurus arizonensis from central Arizona is painful but not dangerous. Scorpions are facinating to watch, but are not for the squemish . You aren't squemish because if you were, you wouldn't be here. 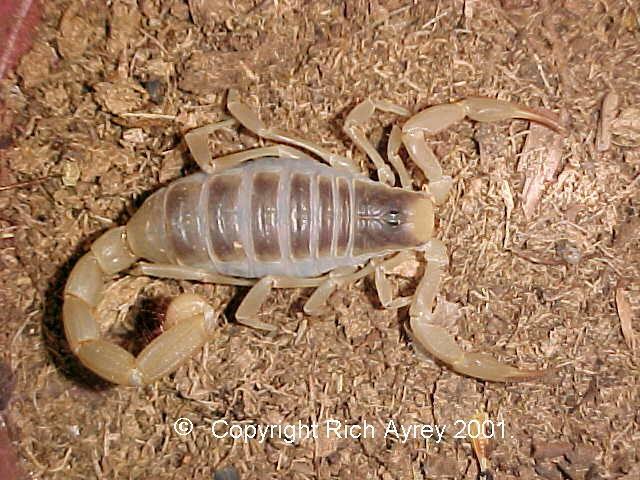 Scorpions have their place in the scheme of things that has nothing to do with stinging people. There are approximately 40 species in the United States. About half of them are found in Arizona. I specialize in Arizona Scorpions. Species directory.Click on species to view. Photographs by Rich Ayrey, do not reproduce without the written permission of the photographer. This site copyright Rich Ayrey 1999-2004. Last updated 04/18/04.